Standard reports available for use from the Completed section in Finance. There are seven standard reports available for use from the Completed section within Finance. These reports will only include expenses that have been Marked as Paid / Reconciled / Billed and reside within the Completed section when you run the report. Setting the correct Date Range and applying the Date Filter is essential for finding the expenses you would like to report on. 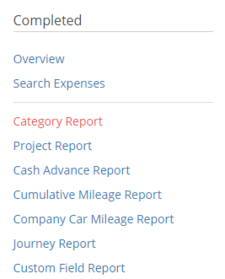 All the Completed Reports apart from the Cumulative Mileage Report have both these date filters. The report will show a breakdown of all project expenditure within a given date range. Any expenses not allocated to a project, will not be included. The report will show how much has been spent by cash advance within a given date range. The report will show you all the personal car mileage a user has completed in that selected Tax Year. The report breaks down the mileage by user and mileage rate. The report shows all company car mileage within the set date range. The report breaks down the mileage by user, vehicle and fuel rate. The fuel rate is the rate the mileage was reimbursed or owed back to the company in the case of fuel card. Please note: Company car mileage logs are always dated the 1st of the month. If you have set up one or more Custom Fields in Admin you can run a report on them using the Custom Field report. The report data will vary depending on the type of Custom Field you have set up.